Are you getting excited for Toy Story Land at Disney’s Hollywood Studios? 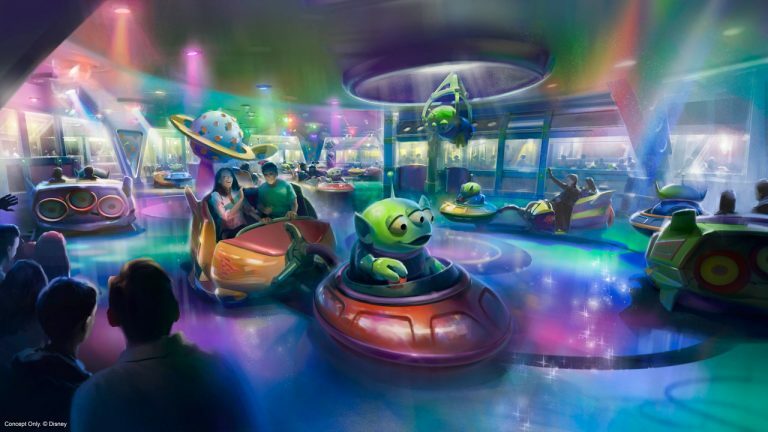 One of the new attractions for this area themed after Andy’s backyard is the Alien Swirling Saucers. Today, Disney shared some unique concept art to showcase just what the attraction will be like, and I have to say, it definitely looks fun! Toy Story Land will also feature the Slinky Dog Dash Coaster and Toy Story Mania, as well as a quick service dining location, Woody’s Lunch Box. Oh and Disney also wanted the rumors quelled. (Ahem….Len and Jim. 😉 ) The park is still, for the time being, going to be known as Disney’s Hollywood Studios. For those waiting impatiently to find out when Toy Story Land will actually open at Disney’s Hollywood Studios, well, that’s still up in the air. According to Disney, the answer to that question is still summer. ← Ask It: Is Your Significant Other a Disney Fan? Loved the artwork released, but even more than that, love that they addressed the name of Hollywood Studios staying the same for the “foreseeable future.” Disney Cinemagine Park is the dumbest name they could come up with! Please please please jettison that name to a different galaxy far, far away. Isn’t that Just Mater’s junkyard Jamboree? It was a fun ride but nothing I would wait more than 20 minutes for! I was just scrolling down to comment the same thing! Following the template set by Mad Tea Party for cloning an Anaheim flat ride to Orlando, it’s Mater’s Junkyard Jamboree with a ROOF! Looks like the old fashioned bumper cars you used to get at the fair (maybe you still do)!!! !